Soprano Ileana Montalbetti, with pianist Kathleen Lohrenz Gable, gave a vocal recital on Friday, January 5, at 7:30 p.m., at Grace-Westminster United Church. Ms. Montalbetti, a Saskatoon native well-known to opera aficionados in the city, currently resides in Toronto. 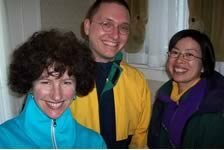 Ms. Gable, collaborative pianist and vocal coach, teaches piano privately and at the University of Saskatchewan. The recital of songs and arias was warmly received; the program appears below. 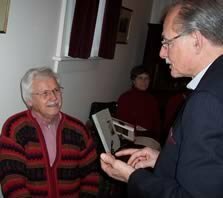 At closing of the 250th birth anniversary of Mozart, two gatherings at Gustin House on February 18 celebrated once again the composer's wonderful music and took delight in the beauty of glass art. Soprano Sarah Vardy and pianist Gregory Schulte performed three of Mozart’s lieder, arias from The Marriage of Figaro, and the Laudate Dominum. Lee Brady, showing his recent fused glass works along with photos of commissioned stained glass installations, spoke about his work in these media. To conclude the program, Michael Swan and Mr. Schulte performed Mozart’s Sonata in B-flat major for Violin and Piano, K.454. Joan Halmo introduced the program with a brief history of the Musical Art Club, which was founded by Lyell Gustin in 1924 and which held its 600th meeting in February 2007. 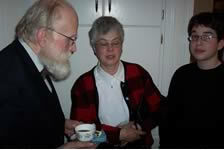 She noted that the February 18 events were themselves a realization of the ideal of Dr. Gustin in bringing together members of the cultural community and friends to share music and the arts. As the five previous inter-arts programs held at Gustin House since autumn 2005 had drawn ever-increasing numbers, both a matinée and a soirée took place on February 18, with a full house each time. Photos below are by Michael Pomedli. 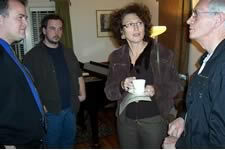 The artist (left to right), Lee Brady, Sarah Vardy, Gregory Schulte, and Michael Swan. Veronica and Jasmine Tso, piano students. Lee Brady, Martha Blum and Eileen MacKenzie. Taylor Steeves, Marion Penna and Dorian Penna, violin student. Lucia Clark with Sister Maureen Maier, OSU. Mark Turner and Sarah Vardy in the back studio. Eileen Wheaton and Kristin Enns-Kavanagh. 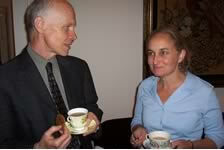 Michael Swan and Doris Bietenholz. Maura Gillis-Cipywynk, with Lee Brady alongside his fused glass bowl; in the background, Marilyn Boechler, John Senior and Allan Few. 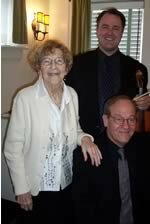 On Sunday, March 25, pianist Boyd McDonald and actors Susan Williamson and Henry Woolf presented a splendid program of music and poetry at Gustin House! Mr. McDonald, prominent Gustin graduate, performed works of the Romantic masters Brahms, Mendelssohn, Liszt and Chopin, along with selections from “Triumph of Love,” which he had composed in 2004 for the Stratford Festival stage. Mr. Woolf and Ms. Williamson, internationally celebrated actors, enchanted the audience with readings of the first six sonnets of Shakespeare; each sonnet was interwoven with music Mr. McDonald had composed specifically for that work. The same program was presented both in the afternoon and in the evening of March 25. This presentation at Gustin House of the narrated Shakespeare sonnets with Boyd McDonald’s piano music was a world premiere. 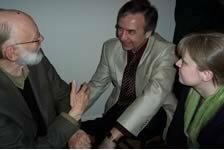 The sonnets, in the original version for baritone with piano, were performed in Calgary the previous week, and the vocal-orchestral setting will be premiered in Hamilton on April 29, 2007. The artists: Susan Williamson, Boyd MacDonald and Henry Woolf. Boyd MacDonald speaks about his compositions. Karen Sterner, Steve Micklewright and Del Micklewright arrive at Gustin House. Doris Bietenholz, Sylvia Shadick-Taylor and Helen Few. Gustin graduates Ewen Coxworth and Reynald Lemke with Kayla Lemke. Susan Williamson visits with Ilse Guenther and Martha Blum; in the background Shirley Pridmore. Walter Thiessen serves dainties to Jan Shadick, Stan Shadick and Jim Wood. 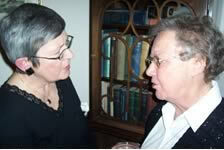 Boyd MacDonald and Karen Wiens of Hague; in the background, Dr. Gustin's music shelving. Jean Cook leaving Gustin House, with a farewell from Edna Thiessen. Thomas Yu, pianist, returned home to Saskatoon to perform in the Lyell Gustin Recital Series, Saturday, April 21, 2007, 7:30 p.m. at Third Avenue United Church. Winner of the 17th International Competition for Outstanding Piano Amateurs in Paris, Yu performed works by Beethoven, Coulthard, Bach/Liszt, Dutilleux and Chopin for a large and appreciative audience. CBC Radio recorded the concert for future broadcast (date TBA). 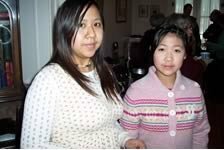 Gustin House congratulates Thomas Yu on recently receiving a 2007 Saskatchewan Lieutenant Governor’s Arts Award! On Sunday afternoon, June 17, a wonderful program of viola music and historic/literary reflections took place at Gustin House, marking the 112th birth anniversary of Lyell Gustin (b. May 31, 1895, Fitch Bay, in the the Eastern Townships of Quebec). James Legge, principal violist of the Saskatoon Symphony Orchestra, and Gregory Schulte, pianist, performed works by J.S. Bach, Robert Schumann, and Ernest Bloch, along with a selection of song transcriptions. Martha Blum, linguist, author, pharmacist, musician, and recent recipient of the Honourary Doctorate of Letters at the University of Saskatchewan, gave a rich and nuanced talk on “The Inheritance of Austria in Word and Music.” Dr. Blum paid tribute to Lyell Gustin--who had been her piano teacher for some time--noting that this celebration of the arts was the very kind of event which Dr. Gustin hosted as early as the 1930s in his elegant piano studios. The appreciative audience enjoyed meeting her and the performers, as well as the viola maker who had created the instrument Mr. Legge played in the program (see photos below; photography courtesy of Michael Pomedli). Trounce House, built in 1883, is Saskatoon’s oldest building. It was originally at the front of the lot at 512 Tenth Street, but was moved to the extreme back of the property to make way for the building of the Gustin family home. In its location near the rear property line, Trounce House was vulnerable from the alley. Further, it was resting on the ground, susceptible to soil conditions. After many months of consultation and planning, the Gustin/Trounce Heritage Committee undertook in spring 2007 the stabilization of the Trounce House. The small structure was raised out of the ground which had built up around it and temporarily re-located in the yard as other work took place on the site. After some days of archaeological excavations, a concrete pad was prepared slightly further into the lot and Trounce House was repositioned on its new firm base. The Committee expresses appreciation to participants in the Trounce project: our fine professional team, Stantec Architecture (Allan Duddridge, principal architect; Kristin Enns-Kavanagh, archaeologist), Wiebe Movers (Vern MacEwen, manager), D2 Construction (Harry Dalsgaard, manager), all of Saskatoon; volunteers from the Saskatoon Heritage Society and students from the Department Archaeology at the University of Saskatchewan, for assisting in the site exploration and dig. For financial support in the stabilization/relocation of Trounce House, thank you to the City of Saskatoon, Saskatchewan Heritage Foundation and Meewasin Valley Authority. Memorable music for duo and trio ensemble graced the Saskatoon summer evening of Monday, August 20! Lucy Hall, originally of Saskatoon and now based in Vienna, along with Austrian cellist Arne Kircher and Saskatoon pianist Gregory Schulte, performed major works from the Romantic repertoire, along with a rather rarely-heard string sonata by Ravel and movements of Piazzolla’s “Four Seasons.” The outstanding performances at Grace-Westminster United Church comprised the 10th program in the Lyell Gustin Recital Series, launched in May 2005 by the Gustin/Trounce Heritage Committee. Gustin House gratefully acknowledges the support of the Saskatchewan Arts Board and all those whose generous services and financial contributions made this and previous recitals possible. 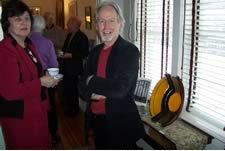 The season’s first inter-arts event took place at Gustin House on Sunday evening, October 28. Oxana Ossiptchouk, violinist with the Saskatoon Symphony Orchestra, James Legge, principal violist of the Saskatoon Symphony Orchestra, and pianist Gregory Schulte performed Mozart’s Trio in E-flat, KV 498 (The “Kegelstatt” Trio), along with other works. Carrie Allen, an archaeological illustrator and a specialist in the analysis and reproduction of ancient art, spoke on mythology as the subject of artwork in the classical period, and showed several low-relief carvings. The photos were taken during the reception by Gustin House photographer, Michael Pomedli. At a program at Gustin House on December 9, 2007, internationally-known artist Otto Rogers spoke about the sources of his artistic inspiration and displayed his newly-published book. Mr. Rogers spent some thirty years at the Department of Art and Art History, University of Saskatchewan, and now lives in Milford, ON. He has more than 1500 art works in public, corporate and private collections in Canada and other countries. Pianists Walter Thiessen and Gregory Schulte, Gustin Studio graduates, performed compositions reflecting an array of musical colours. Included in their repertoire were the seasonal favourites “Jesu, Joy of Man’s Desiring” and “Sheep May Safely Graze “ by J. S. Bach, and “Fantasia on Greensleeves” by Vaughan Williams, along with a Concerto Grosso by Handel and selections from Brahms’ Liebeslieder Waltzes. Designed as a reflective moment in the midst of a busy season, the program was presented to full houses in both the afternoon and evening. Gustin House acknowledges gratefully the collaboration of the Mendel Art Gallery in this event. Bonnie Bentham and Lorenzo Dupuis look on as Deborah Rodger examines Otto Roger's book, "The Intelligent Exercise of the Rational Soul"